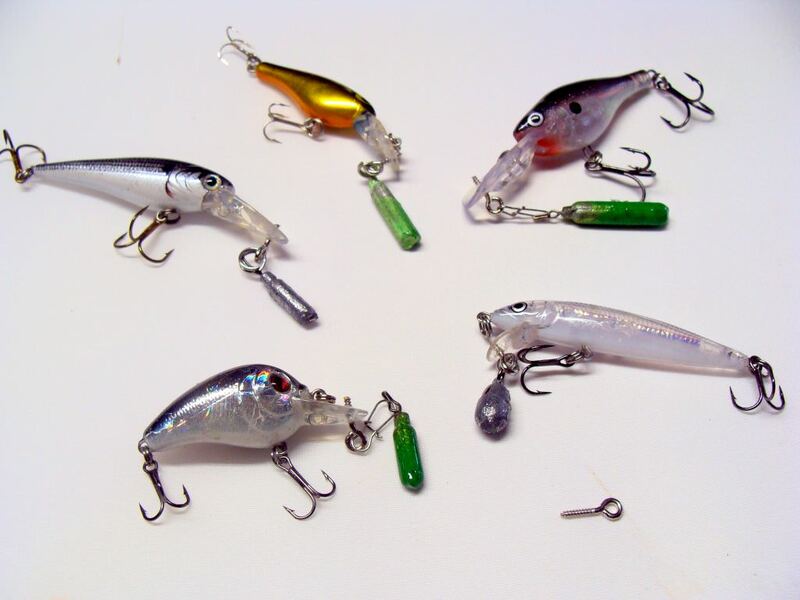 So clam has these crank weights to use your floating baits on the ice. Just curious how or if anyone has used this system. I feel like for big perch pounding the bottom and the tail staying raised tipped with a minnow they could be killer or walleye. Even using small flat bills for crappie sounds like it would work why buy Rippin raps and limit the different styles you can get from the boxes we got stored in the basement. So please let's hear your experience if you have done so and advise one how much weight to use. Also it seems so simple sure the old timers are gonna say they been doin this for years with lead from old car rims lol no offense to the wise. $5 for 3 painted sinkers. I may try making a few on my own and see if I like the results. I have wire, paint and god knows I have sinkers. Oh yea I have dozens of crank baits that are unemployed at the moment. I posted a pic below. I whipped one of these up w/o any troubles. I took a bell sinker and cut off the shaft wire. Turned it upside down and used a piece of spinner shaft to make a new shaftbending it with some pliers to make it stay on the shaft and a closed snap type top. sprayed it with some handy paint and there you have it. I think for the size bait a smaller sinker would work better but it was an easy to do project. I'm going to try a few more sizes and give them a try on the Susky if it ever freezes. I plan to do the same thing just make them but want to try on smaller cranks but bigger bills to make a lot of vibrations. I use Rippin raps and Crappie just slam them but the small 1.5. and don't need bait. Maybe some bomber cranks or flicker minnow in the smaller sizes. now I'm getting pumped for iceing fish. I used a little different approach but same basic idea. Used a screw eye in the plastic lip. Can remove and use on open water with no ill effect on bait. Do they work ? I have two dozen of rigged this way. That ought to tell ya something. Very nice , can we see some pics ? Wow, Great idea , I know what I will be doing this week, I have a bunch of stick baits with rattles I want to try. Hope everyone had a great off season...and getting the itch for ice again! Interested in how these worked out for you...any problems with line hang ups etc?